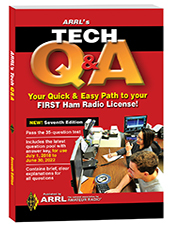 This seventh edition of ARRL’s Tech Q & A is your authoritative guide to every question in the Technician (Element 2) question pool – everything you need to ace your first Amateur Radio license exam! Using ARRL’s Tech Q & A is the best way to review for the exam with confidence. Discover the excitement of ham radio. The Amateur Radio Service offers a unique mix of public service, technology, and experimenting with electronics--all with an emphasis on fun. Some hams use their skills to provide communications during emergencies and disasters when all else fails. Others enjoy talking to people across the country and around the globe, and operating portable radio equipment from anywhere. Get started today!. Use this book with ARRL Exam Review for Ham Radio to take randomly-generated practice exams using questions from the actual examination question pool. You won’t have any surprises on exam day!